‘The gold nanoparticle array is easy to create with modern nanofabrication methods. Near the nanorods, light can be focused into tiny volumes, even below the wavelength of light in vacuum. These features offer interesting prospects for fundamental studies and applications of the new condensate,’ says Academy Professor Päivi Törmä. 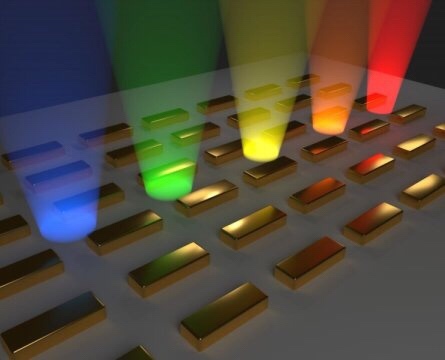 ‘As the condensate takes form, it will emit light throughout the gold nanorod array. By observing the light, we can monitor how the condensation proceeds in time. This is how we can turn distance into time,’ explains staff scientist Tommi Hakala. The light that the condensate emits is similar to laser light. ‘We can alter the distance between each nanorod to control whether Bose-Einstein condensation or the formation of ordinary laser light occurs. The two are closely related phenomena, and being able to distinguish between them is crucial for fundamental research. They also promise different kinds of technological applications,’ explains Professor Törmä.